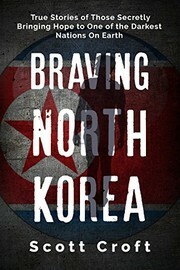 1 edition of Braving North Korea found in the catalog. Add another edition? Are you sure you want to remove Braving North Korea from your list? Published November 9, 2017 by Independently published . Ruled by a maniacal dictator and cut off from the outside world, the citizens of North Korea are living in a darkness that has nearly destroyed them. Famine, malnourishment, and poverty are rampant as the North Korean government spends fortunes on nuclear weapons testing. Christians inside the closed nation face brutal persecution to ensure the underground church survives. But hope is not completely lost. Everyday, brave men and women put their lives on the line to bring light into the darkness. “Braving North Korea” is a collection of their covert stories of rescue, aid, and underground discipleship as they risk all to bring the Gospel to the most persecuted nation on earth. A portion of your book purchase will be donated to continue underground efforts that serve persecuted Christians inside North Korea. Join the rescue today! December 30, 2017 Edited by Todays Martyrs Reviewer Edited without comment. December 30, 2017 Created by Todays Martyrs Reviewer Added new book.